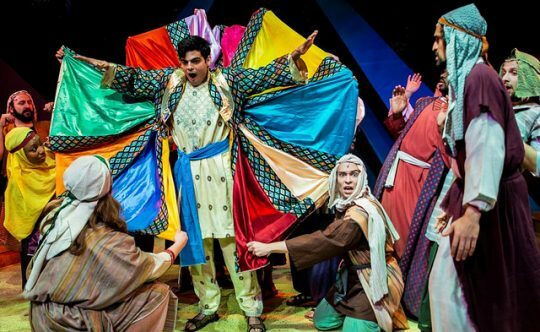 First performed on Broadway in 1982, this interpretation of the Old Testament’s story of Joseph and his brothers through contemporary eyes is a fun, high-energy show featuring a delightful chorus of local children. Based on Joseph’s “coat of many colors” from the Book of Genesis, the story shows what can happen when a parent plays favorites. Catch “On The Town,” a high-energy wartime musical about three sailors on a 24-hour leave who are looking for love and adventure in New York City. Performed by the Highland Park Players through October 28, this Tony Award-nominated musical features thrilling music by Leonard Bernstein with playful lyrics and book by Betty Comden and Adolph Green. What makes this show so unique (and challenging) is the blending of musical comedy with ballet, just as the young Bernstein envisioned and would go to recreate in “West Side Story” as well. If you listen carefully, you can hear some of the same musical arrangements made famous in “West Side Story,” yet Bernstein was only 26. The Highland Park Players pull it off with amazing choreography, beautiful singing and impressive costumes. 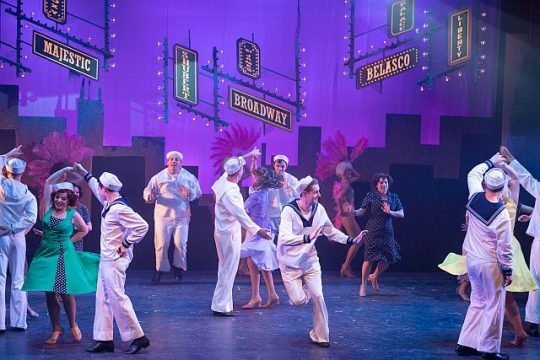 Based on the 1944 Broadway show and 1949 film starring Gene Kelly, Frank Sinatra and Jules Munchin, On the Town captures a time when anything and everything was possible. While humor runs throughout the show, it leaves the audience with an uncertain, but hopeful ending. “On The Town” is directed and choreographed by Dina DiCostanzo. The production stars Aaron Stash as Ozzie, Christopher Johnson as Gabey, Steven Schur as Chip, Brittny Goon as Claire, Justine Klein as Hildy, Ariana Cappuccitti as Ivy, Naomi Hershman as Madame Dilly and Geoff Isaac as Pitkin. Music Director/Conductor Aaron Kaplan leads a dazzling 22-piece orchestra that has never sounded better. Also, kudos to scenic designer Brett Baleskie for his imaginative subways cars used throughout the show and to Rachel Parent for her authentic costume designs that reflect the times. 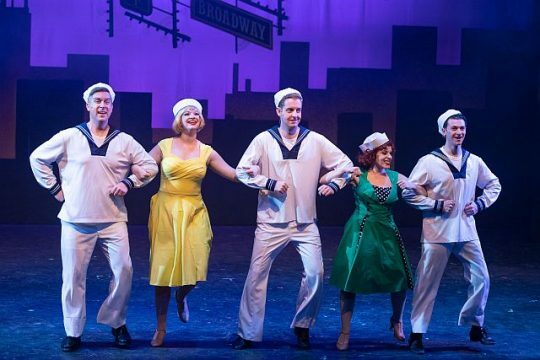 DETAILS: “On the Town” is at Northbrook Theatre, 3323 Walters Ave., Northbrook. Running time: Approximately 2.5 hours with intermission. For tickets and other information, call the Northbrook Theatre at (847) 291-2995 or visit Highland Park Players. 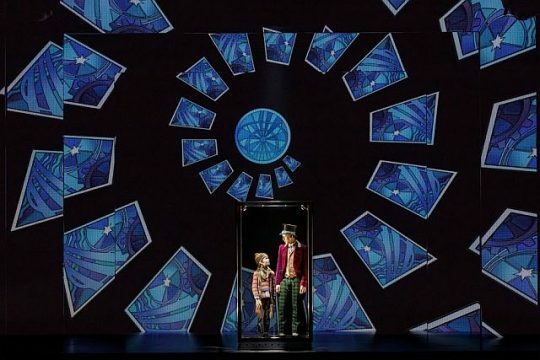 Roald Dahl’s timeless 1964 classic comes to life on stage in this phenomenal, highly-imaginative production of “Charlie and the Chocolate Factory,” now playing through October 21 at the Oriental Theatre in Chicago. Capturing the dreams of the young and young at heart, the musical tells the story of the world-famous chocolatier Willy Wonka. Sales of his candy are down, so he holds a contest to award a tour of his factory to five lucky “golden ticket” winners. Featuring a cast of zany characters, including an impoverished Charlie Bucket, the children and their families go on a life-altering journey through Wonka’s factory with surprising results. With direction by three-time Tony Award® winner Jack O’Brien, the show features music by Grammy®, Emmy® and Tony Award® winner Marc Shaiman with lyrics by Grammy® and Tony Award® winners Scott Wittman and Marc Shaiman. 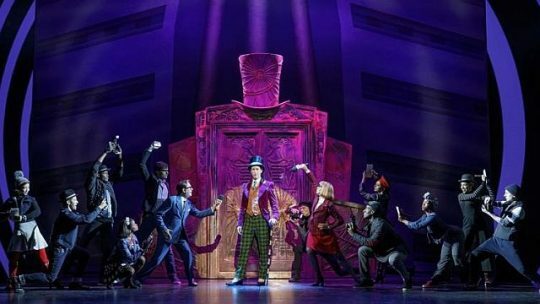 Superb scenic and costume design by Mark Thompson recreates the colorful world of Willy Wonka. Innovative choreography by Joshua Bergasse highlights the show. It was fun to watch the numerous children in the audience as they experienced the Oompa-Loompas, eye-popping visuals, glass-elevator and crazy demise of the “spoiled” children. Noah Weisberg is delightful as the purple-caped, top-hat-wearing Willy Wonka. He portrays Wonka with innocence and charm, yet a touch of evil. Henry Boshart (Collin Jeffery and Rueby Wood alternates) steals the show as the downtrodden Charlie Bucket. He dreams of a better life for himself, his widowed mom and four beloved grandparents. He’s adorable, high energy with a sweet singing voice. The real stars of the show are the Oompa-Loompas, creatively imagined as puppets and humans dancing together and the incredible dimensional visuals showcasing a world of candy, color and animation that are pure magic. The entire show is a graphic feast to behold. “Charlie and the Chocolate Factory,” is an ideal show to introduce children to the world of musical theater. DETAILS: “Charlie and the Chocolate Factory,” is at the Oriental Theatre, 24 W. Randolph St. through Oct. 21, 2018. Running time: 2 hrs. 30 min. with one intermission. For tickets and other information, visit Broadway in Chicago. What is family? Can it be created or reborn? “A Shayna Maidel” answers these thoughtful questions in a most profound way. Written in 1984 by Barbara Lebow and now performed as a revival by TimeLine Theatre, the play confronts the horrors and aftermath of the Holocaust. Two sisters and their father, reunited after years of separation, are now forced to examine their roles, responsibilities and guilt. Get ready to cheer! 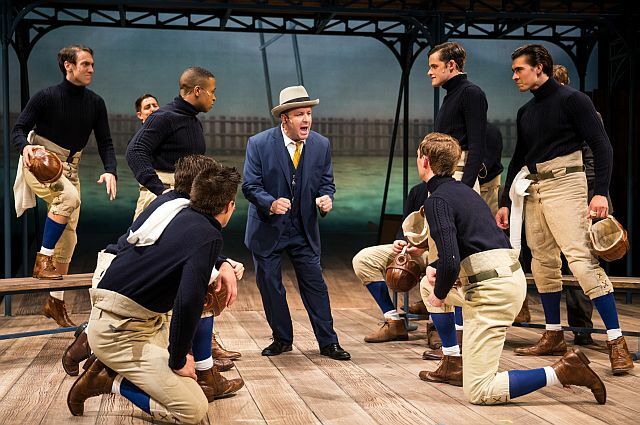 Based on the life of legendary Notre Dame football coach, Knute Rockne, “Something in the Game – An All-American Musical” kicks off with all the excitement of a season opener. Featuring a cast of 23 professional and student actors, this dynamic musical enthralls the audience with an inspiring story, high-energy dancing and memorable music. On the football field, Knute Rockne is regarded as one of the greatest football coaches of all time winning more than 100 games, three national championships and five undefeated seasons. But at what cost? As he chased fame and glory for his Fighting Irish as well as his own personal success, he left his family on the sidelines. Using football as a metaphor for the “game of life,” the musical traces one man’s journey to discover what’s really important before it’s too late. Stef Tovar as Knute recreates his 2008 role from the production of the show at Theater at the Center. He does an excellent job as an ambitious man looking to capture the American Dream. Adrian Aguilar as George Gipp, the promising young star who lets his demons destroy him, is captivating. But it’s the women who command the stage. Dara Cameron as wife, Bonnie, is a standout with a voice so strong and pure, it practically melts your heart. Rashada Dawan belts it out as Thelma, hostess of Jimmy the Goat’s place, with non-stop energy. 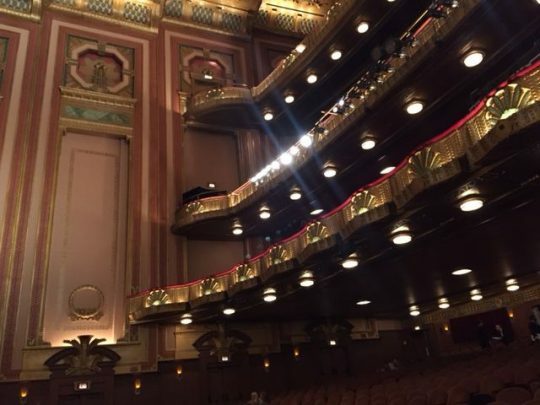 The production, put on by the American Music Theatre Project and Wirtz Center for the Performing Arts, is presented by special arrangement with Coaches, LLC, John Girardi and Greg Schaffert. 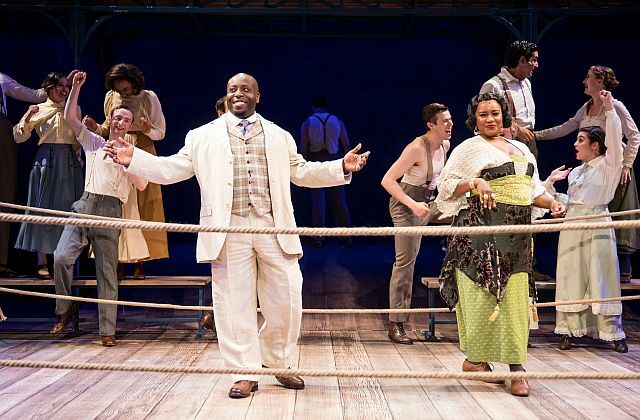 With book by Buddy Farmer, music by Michael Mahler and lyrics by David H. Bell and Michael Mahler, the show is expertly directed and choreographed by Jefferson Award-winner Bell. Mention must be made of the outstanding choreography that simply takes your breath away. It is fast-paced, innovative and imaginative. Coupled with the gorgeous costumes by Robert S. Kuhn, the entire production creates an unforgettable visual feast! For those who’ve heard the battle cry, “Win one for the Gipper,” you’ll come away with a new understanding of where this came from. “Something in the Game: An All-American Musical” is at the Josephine Louis Theatre, 29 Arts Circle Drive, on the Northwestern University Evanston campus through Aug. 5, 2018. Running time: 2 hours and 15 minutes with one 15-minute intermission. For tickets and other information, call( 847) 491-7282 and visit Wirtz Center. “Buddy” tells the tale of singer/songwriter Buddy Holly and the Crickets through an all too brief career ended by tragedy. Yet, some 50 years later, his music continues to be played and loved by a whole new generation. Classic songs include: “That’ll be the Day,” “Maybe Baby,” “Peggy Sue,” “It’s so Easy to Fall in Love,” “The Big Bopper’s,” “Chantilly Lace,” “Ritchie Valens,” “La Bamba,” plus many more. When performing the biography of a legend, how successful the show is depends on who plays the star. In this case, Zachary Stevenson who performed in Paramount’s “Million Dollar Quartet,” is spectacular. Not only does he physically resemble Holly, but he exudes Holly’s dynamic energy and has all his dance moves down pat, such as hopping on one foot as he plays the guitar. Stevenson’s portrayal of Holly is a joy to watch. Angela Alise, Liz Chidester, Vasily Deris, Ann Delaney and Molly Hernanez (Preview) in Buddy: The Buddy Holly Story. But credit must be given to the entire ensemble whose amazing performances, both vocally and with a range of instruments, are stellar. Piano, violins, bass, electric guitar and drums glide in and out throughout the show. Although they don’t appear until late in the second act, Cisco Lopez as Ritchie Valens and Vasily Denis as Big Bopper are outstanding. 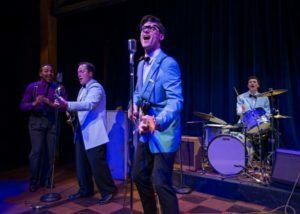 “Buddy: The Buddy Holly Story,” an American Blues Theater revival is written by Alan Janes and directed with precision by Lili-Anne Brown. Musical direction is by ensemble member Michael Mahler and costume design is by Samantha C. Jones who must have a ball putting these 1950’s costumes together. However, instead of ending on a downer the show explodes with more of Holly’s music as an enduring testament to his legacy. The audience never wanted it to end. Prepare yourself for one fabulous night of theater! DETAILS: The Buddy Holly Story is an American Blues Theater production at Stage 773, 1225 W. Belmont Ave., Chicago, through May 26, 2018. For tickets and other information call (773) 327-5252 or visit American Blues Theater. This classic, Tony-Award-nominated musical comes to life in the hands of Kokandy Productions in Theater Wit. The moment you enter, the elegant set creates a warm ambience and violin and percussion sounds welcome you. Up above and off stage, you hear the sounds of a crowd. Then, once the narrator, the good Colonel Doctor begins, the production takes off like a shot. With book by Luther Davis, music and lyrics by Robert Wright, George Forrest and Maury Yeston, ‘Grand Hotel’s 1989 Broadway production earned 12 Tony Award nominations and won five. 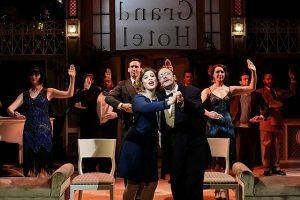 Based on the 1928 play/novel “Menschen im Hotel” (People in a Hotel) and the 1932 MGM movie, the musical focuses on life and death, success and failure, love and murder all told through music and dance. Every child who hears the words from the song, “I won’t grow up” can relate to Peter Pan who runs away from home so he doesn’t have to grow up. Originally produced on Broadway in 1954, ‘Peter Pan’ has been a traditional favorite in its many incarnations on TV and the live stage throughout the years. Peter Pan flies high at Music Theater Works in Evanston. 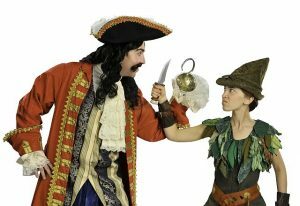 Bring your children as well as your inner child to the Music Theater Works (formerly Light Opera Works) to see this wonderful production of ‘Peter Pan,’ now through Jan. 1, 2018. This family classic includes the songs “I Gotta Crow,” “I Won’t Grow Up,” “I’m Flying” and “Neverland” accompanied by a full orchestra. ‘Peter Pan’ is directed by Music Theater Works artistic director Rudy Hogenmiller, conducted by music director Roger L. Bingaman and choreographed by Clayton Cross. The sets are purely magical and depict the wonderful imagination of Adam Veness (scenic) and Robert S. Kuhn (costumes). Aubrey Adams as Peter can sing, dance and keep up with the Lost Boys. She brings high energy and excitement to the role. The remarkable Larry Adams shines in his role as irrepressible Mr. Darling/Captain Hook, especially as Captain Hook who lives in fear for the time-ticking crocodile. Stand outs include Elizabeth Stenholt (Wendy Darling/Jane) with her beautiful, sweet voice, Anna Marie Abbate (Tiger Lily) and Cary Lovett (Smee). The antics of the Lion, Kangaroo, Ostrich and of course, Nana the dog, brought gales of laughter from the children. 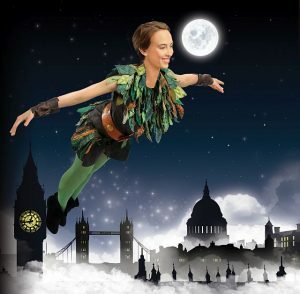 Bring your family and share the ‘Peter Pan’ you loved as a child with your own youngsters. ‘Peter Pan’ is Music Theater Works’ final production of 2017. The 2018 season will begin with ‘The Pirates of Penzance’ (June 9-17), and continues with ‘Anything Goes’ (Aug. 18-26), the concert performance ‘Judy Garland: Come Rain or Come Shine ‘starring Angela Ingersoll (Oct. 5-14) and ‘Into the Woods’ (Dec. 22-31). DETAILS: ‘Peter Pan’ is a Music Theater Works production at Cahn Auditorium, 600 Emerson St., Evanston. Running time is 2 hours 30 minutes with two intermissions. For tickets or for more information, call (847) 920-5360 or visit Music Theater Works. 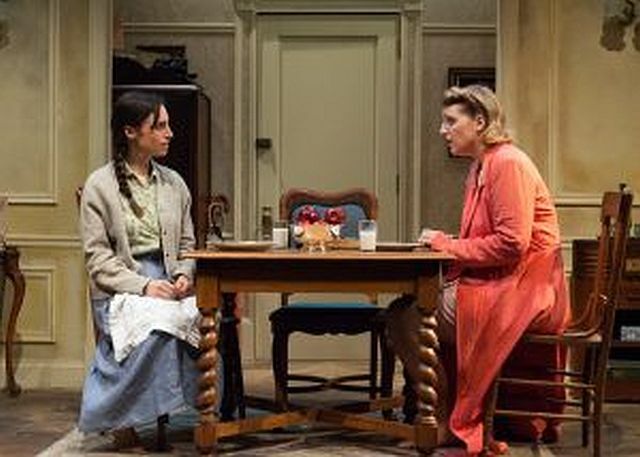 For more shows, visit TheatreinChicago. Catch your breath! First and foremost, ‘Newsies’ is known for its powerhouse, high energy dancing. Based on the 1992 movie and inspired by the real-life Newsboy Strike of 1899, this Tony-award winning musical boasts a delightful score by eight-time Academy Award winner Alan Menken, lyrics by Jack Feldman, and book by four-time Tony Award winner Harvey Fierstein. It’s a David versus Goliath story that shook the ivory towers of publishing titans William Randolph Hearst and Joseph Pulitzer in New York City at the turn of the last century. The story could just as well have come from the headlines of today’s newspapers about social injustice and workers striking for well-deserved benefits. It’s the ultimate story of courage and believing in one’s self. ‘Newsies’ follows orphan Jack Kelly and his rag-tag band of young newsboys who dream of a better life than living on the streets. Choreographer and Jeff Award nominee Alex Sanchez (Marriott Theatre: Evita, On the Town, Mary Poppins) brings his high-octane energy and brilliance as director of the heartwarming piece with Musical Direction by Jeff Award winner Ryan T. Nelson. Patrick Rooney stars as Jack Kelly who’s got enough swagger and spit to win the heart of beautiful Eliza Palasz as Katherine Plumber. Stand-outs include the wonderful Stephanie Pope as Medda Larkin, Nick Graffagna as Davey, the brains behind the union and Matthew Uzarraga as Crutchie. The ensemble earn well-deserved kudos for their passionate, powerful dance moves. DETAILS: ‘Newsies’ is at Marriott Lincolnshire Theatre, 10 Marriott Drive, Lincolnshire through Dec. 31, 2017. Running time: 2 hours, 20 minutes with one intermission. For tickets and other information call (847) 634-0200 and visit Marriott Theatre.